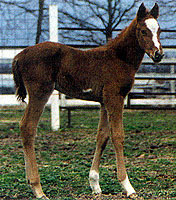 ROCK EM SOCKS was born on the cold, wet, muddy afternoon of March 18, 1999. He was 41 inches tall and weighed 130 pounds. He is shown on the left at 4 days old. In January 2002 he was acquired by his current owner, Jody Wieberg of Excello, MO. Jody had trained Socks (now known as George) for his previous owner and, when presented with the opportunity to buy him did so. Watch for Jody and George in barrel racing competition in 2003. The photos above were taken in September & November 2002. He is now 16.1 hands tall and weighs 1300 pounds !